Gestational diabetes is a type of diabetes that first occurs during pregnancy. The extra glucose can affect the mother and the baby. Obesity or being overweight — This can affect the body’s ability to use insulin. Also, hormones that help the baby’s growth may interfere with insulin. 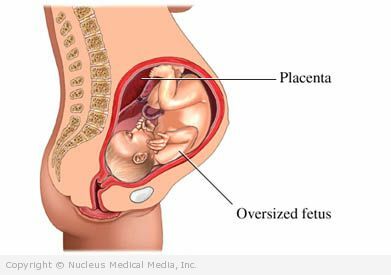 As part of prenatal screening, your doctor will test you for gestational diabetes. If you don’t have a history of diabetes, the test will be done at 24-28 weeks of gestation. The doctor will give you a drink that has a special glucose solution in it. The doctor will then measure the level of glucose in your blood. Other tests may be used that require fasting (not eating or drinking anything). If you are high risk for gestational diabetes or have symptoms, your doctor will test you earlier in the pregnancy. Avoid foods high in sugar (eg, soda, candy, cookies). Manage your portions sizes at each meal. Plan a bedtime snack each night. It should include protein and complex carbohydrates (eg, legumes, potatoes, corn, rice). Do not gain more weight during pregnancy than your doctor recommends. Excess weight can increase complication in your pregnancy. It will also make it more difficult to control your diabetes. A blood glucose monitor will help you check your glucose levels throughout the day. Knowing your glucose level will help you plan your meals, activities, and medicine. Keep a record of your results. Discuss them with your doctor at your visits. After delivery, glucose levels usually return to normal. Your doctor will check your glucose levels to make sure that you no longer have diabetes.